For the newest installment to the Fast and the Furious story (in theaters April 3rd), a billboard was created to promote the movie with graffiti artists Mr. Cartoon, Revok and Toomer. The collaboration of artists, as Mr. Cartoon says, “fits in graffiti perfectly with car crashes”. 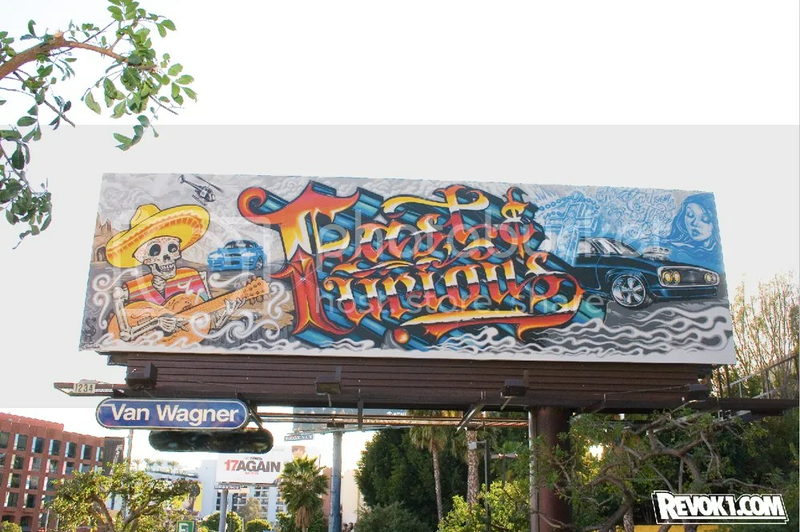 The billboard pays homage to the Mexican references from the movie, and also adds in parts of the street art as well as the signature Charger muscle car featured in the movie. The Fast and Furious 4, directed by Justin Lin (same director for Tokyo Drift), is centered around the underground drug and crime industry and the movie takes your from the deserts of Mexico to the streets of LA, where the two lead roles (Vin Diesel and Paul Walker) are forced to team up to take down a common enemy. Video of the making of the Billboard, via Hypebeast. The song is called “We Are Rockstars” by Does It Offend You, Yeah?